Before I started reading this book, my thought was, "I'm pretty sure this book is going to thoroughly piss me off. Reading anyway." Post reading, yep, this book is rage-inducing. It is also, at the end, hysterical, because of the absurdity of the whole thing. That someone so incredibly incompetent even thinks he is remotely competent makes me realize just how thankful I am that most smart people are essentially good. Had Trump actually been smart and this psychopathic, we'd all be in far, far worse trouble than we are in now. Found out yesterday that if you signed up for the Trump campaign emails, they send out “buy this trump stuff” emails now. What I REALLY want to happen is that the Emoluments Clause to trigger a billion dollar tax bill on Trump when he leaves office, to pay back all his gains during his tenure. Then have it all go to education. That would be sweet, sweet justice. Or impeachment now. That would be okay, too. 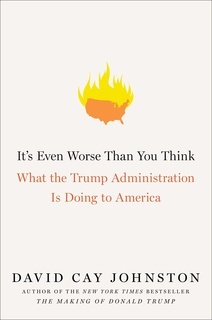 The book is worth reading, even if the subject matter is the step-by-step dismantling of American Democracy. It's a painful story to read, so read fast or borrow the audiobook from your library (before even those are defunded). I just wish that the people not blind to rational thinking but who had voted for Trump "for a political change," read the book. That would be great. I'm not holding my breath for it, though. The couple also complained that Trump was in violation of the sixty - year lease of the Old Post Office , which was owned by the federal government. Section 37.19 of the lease“ specifically forbids ”any federal employee from receiving any gain or benefit from the lease." “The Foreign Emoluments Clause was forged of the Framers’ hard - won wisdom. It is no relic of a bygone era , but rather an expression of insight into the nature of the human condition and the essential preconditions of self-governance. Franklin’s point was that self-governance requires people to accept the burdens as well as the benefits of freedom. It means they are responsible for their fate and cannot just blame a crazy king or an uncaring despot or anyone else. They must, to be free, take personal responsibility and be actively engaged in shaping the policies that will affect not only their lives, but those of generations to come. Under our Constitution we determine our political fate. If we wish to turn in our citizenship responsibilities and outsource the work to power mongers, we can do so. Democracies do not die dramatically. They slowly fade away.